Pre-heat oven to 200°C/400°F/gas mark 6. Rub salt and pepper on to the pork skin and into the score lines. Place meat in a roasting pan, skin-side up and cook for 20 minutes before reducing the heat to 180°C/350°F/gas mark 4 and cooking for a further 1 hour 20 minutes. For the glaze, stir together 2 tablespoons of honey and orange juice. Brush roast with glaze during the last 15 minutes of cooking. Meanwhile, for the sauce, in a medium saucepan combine apples, water, garlic, and grated ginger. Cover and bring to a boil. Reduce heat. Cover and simmer for about 10 minutes or until apples are tender. Stir in ¼ cup honey, orange peel, and cinnamon. Simmer uncovered for 5 minutes, stirring once or twice. Set aside. When the pork is cooked, drain off the oil, remove it from the oven and allow it to rest for at least 15 minutes. Slice and drizzle with apple sauce. Serve with potatoes and seasonal vegetables. 5-WAYS: Roots and Fruits sell fresh fruit and veg at the Five-ways bungalow, 2 Ridingleaze. 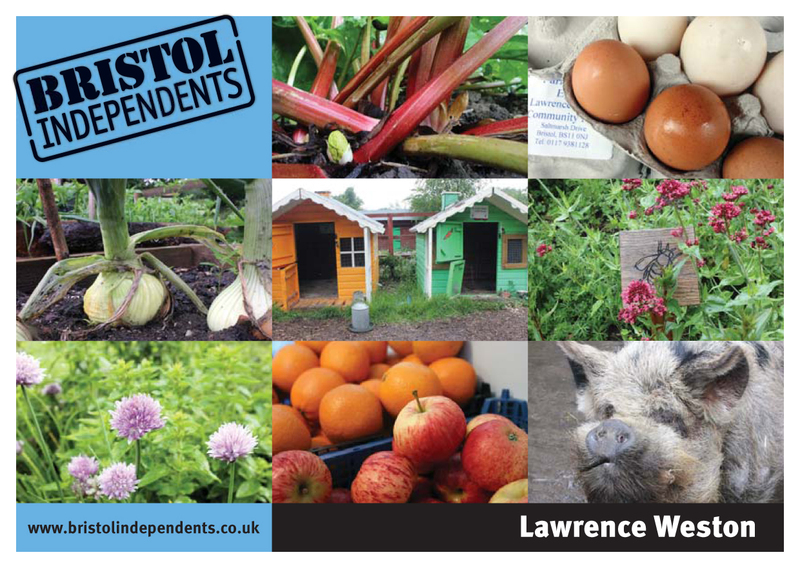 LWCF: Lawrence Weston Community Farm.